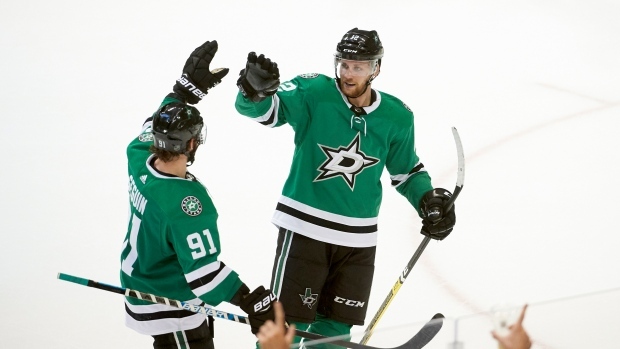 DALLAS — Alexander Radulov started a rally and John Klingberg finished it as Dallas kept firing shots in its busiest period in team history. "It's always hard to come back from 3-0 down," Radulov said. "Today the hockey god was on our side." Klingberg's goal from the right point to the upper left corner of the net came at 17:46, 2 seconds before a roughing penalty against Gibson expired. "(The power play) was a huge key tonight, especially on that one when the game-winner was scored," Radulov said. "We were winning all those neutral pucks." "It was amazing to see that comeback," Khudobin said. "If I could have a pillow, I would probably fall asleep." The loss was Anaheim's first. Dallas is 3-1. Anaheim's Jacob Silfverberg and Kiefer Sherwood had first-period goals, and Adam Henrique added a power-play goal at 8:09 of the second, when the Ducks had only four shots on goal. "I think it put a little desperation in us," Montgomery said. "We changed all four lines. I wanted Radulov to get (Valeri) Nichushkin going. I thought (Jason) Spezza would be a good centre with that group." Nichushkin and Spezza assisted on Carrick's goal. "Those lines all generated chances," Montgomery said. "We hung our goaltender out to dry," Ducks coach Randy Carlyle said. "That's inexcusable for a hockey club to put a guy in that type of situation, under siege for 20 minutes. They turned their game up." Anaheim's first-period goals resulted from long-range shots. At 13:28, Sherwood scored his first NHL goal when he tipped Josh Manson's shot from the right point up and past Khubodin. Dallas finally took advantage of the huge advantage in shots on goal at 11:14 of the second, when Radulov scored from the left faceoff circle on the Stars' first power play. At that point, they had outshot Anaheim 28-13. That goal seemed to energize Dallas. On the Stars' next four shots, they scored twice 9 seconds apart to tie the game at 3. NOTES: Dallas twice has had 25 shots in a period, most recently in the second period against Pittsburgh on March 16, 1997. ... Anaheim's captain, C Ryan Getzlaf, (pulled groin muscle) missed his third game. RW Carter Rowney left the game with an upper-body injury. ... Seguin leads the Stars with 10 points (3 goals, 7 assists). Silfverberg has six points (two goals, four assists) to lead the Ducks.